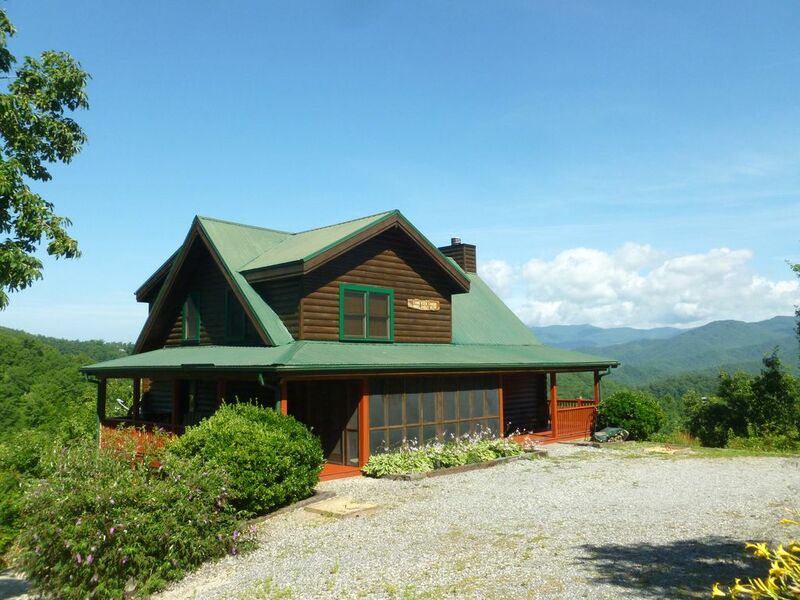 A custom built Tennessee Log home with easy access via a paved road and STUNNING views of the Great Smoky Mountains National Park. Great Smoky Mountain Railway Station and Deep Creek Park (Hiking & Tubing) in Bryson City-15 minutes, Cherokee-30 minutes, Nantahala Gorge-15 minutes, and Maggie Valley-45 minutes. Staying in or going out will be your most difficult decision each day. From the covered porch, enter the 14' X 30' Great Room with 25' cathedral ceiling. There is central AC to chill out our summer guest, or central gas heat to thaw out our winter guest. Cozy up to the wood burning fireplace with gas starter. On rainy days enjoy the big game or movie on the satellite dish with Flat Screen HD TV. Our open kitchen allows for multiple cooks and helpers. Flexible seating allows for large or intimate mealtime settings. There is an island for 2, a bar for 4, and a table for 6. After dinner, renew old times while playing a variety of board or card games (provided) for adults and/or kids. The cabin sits on a finished full basement that contains a Pool Table, Ping Pong Table top, and a flat screen HD TV Comfortable sofa recliners provide a "theater" style experience. This is where the girls send the guys to play pool, ping pong, and watch their favorite sporting event, but the girls will be comfortable here also if they wish. At bedtime, retire to the master suite (queen bed) on the first floor, or on the second floor the 2nd bedroom (queen bed), 3rd bedroom (queen bed and single bunk beds), and open loft area (sleep sofa). Large closets, porches, and decks are available to experience the fresh mountain air, and store all your outdoors gear. Enjoy the morning sun from the screened porch, and sunsets from either the 300 sq. ft. upper deck, or while swinging your cares away in the 5' porch swing located on the 300 sq. ft. covered lower deck. And yes, there is a hot tub too! Small Grassy area for small children to play. Private hot tub on outdoor lower deck with mountain views. Children must be attended at all times. Fireplace (wood provided for $1/stick), Central gas heat, Central Air Conditioning, Three Satellite Flat Screen HD TVs. one VCR, One DVD Player, One CD Player, Fully equipped Kitchen with Microwave, Toaster Oven, Coffee Maker, and all Utensils provided, All Bed and Bath Linens provided, Initial supply of hand soap, bath soap, dish washing detergent, toilet tissue, and paper towels provided, Hair Dryers and Charcoal BBQ Grill. Buy your supplies/groceries at the modern Ingle's Supermarket located in Bryson City, or eat out at a variety of restaurants in Bryson City or nearby Cherokee. No Smoking, No Telephone, but cellphone service is available. Everything that was expected and then some. The views are spectacular. The views from Longview Cabin are spectacular!!! The cabin was immaculate and had plenty of room for our family. Loved having fires in the fireplace, and playing pool and ping pong in the basement. Bryson City is a very quaint town with a variety of restaurants and shops. The area around is very scenic and beautiful. We had a great time! It was so beautiful it makes you not want to leave. Can express it enough it was so beautiful they had everything we needed we just had to get a couple of centrioles like food but other than that the stay was really great. We spent the weekend at Longview Cabin and had a wonderful time! Everything was just as we expected it to be! Well stocked kitchen, wonderful areas to relax, amazing views, comfortable beds and very close to town (but still felt secluded). We would love to stay here again! We stayed during the week between Christmas and New Year's day with our adult children and grandkids. Plenty of room for everyone and nobody got bored either. The gameroom downstairs got plenty of use as did the hot tub. We cooked meals everyday and had no problems with anything. Robert was great to work with and quick to respond to a couple inquiries I had. The home is beautiful and the views are fantastic. We would recommend Longview Cabin to anyone without hesitation! spent a weekend here for the polar express with one other family. the house is exactly as described with plenty of space for everyone. fully stocked kitchen, good wi-fi & cell service in the house. great game/media room in the basement. Robert was extremely responsive and a great host! one thing to note is the house is up a steep, winding mountain. unfortunately it snowed while we were there so we had a little trouble getting down the access road, so take caution if traveling in the winter or if there is snow in the forecast. otherwise great time & highly recommend. There is a $200 security/refundable damage deposit due within 7 days of deciding to book. The full Rental amount is due 30 days prior to your check-in date. Housekeeping fee is based on the number of guests in your party. Rates are based on 4 people. Additional guests are $10-15/person/day + tax depending on the season. $200 deposit is nonrefundable in the event of cancellation more than 30 days prior to check-in date. Full Rental amount is nonrefundable if cancellation occurs 30 days or less prior to check-in date.